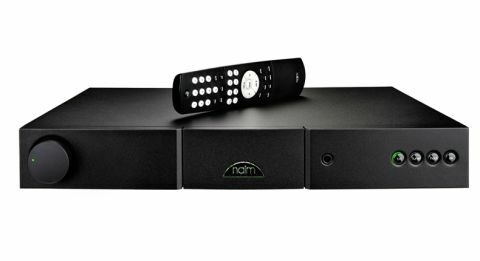 Naim Nait 5si review | What Hi-Fi? The 2013 Award-winner may have just lost out to Rega’s punchier, more revealing (and pennies cheaper) Elex-R in a tight head-to-head during this year’s Awards discussion. But discount the Nait 5si at your peril – especially if hearing your system through headphones is important (the Rega doesn’t have a headphone output, remember). Nothing blemishes the aluminium front fascia, save the volume control, placed quirkily on the left, four input buttons on the right and the 6.35mm headphone jack. It’s under the hood that you’ll find the most changes. Power output has taken a jump from 50W to 60W per channel (into 8 ohms), thanks to a larger toroidal transformer and improved power supply. The main circuitboard and wiring loom have also seen improvements, drawn from work done on the excellent Naim DAC-V1, while components in the power amp stage and all signal capacitors have seen an upgrade too. The inputs available are the same as ever, with four stereo RCA inputs and two DIN connectors. Since the Naim Nait 5si has no screen, the chosen input will instead feature a green circle of light around its input button. Simple, but effective. When it comes to spending almost £1000 on an amp, you want power and drive (an amp’s main duty, after all). In this respect, the Naim delivers. There’s genuine muscle behind its performance that feels beyond its 60 watts. Play one of the most dynamic tracks in our music library, John Williams’s The Theme from Jurassic Park, and the 5si rises to the occasion, giving crashing cymbals weight and conveying a scale that puts you in awe of both the composition and amp. Yet the Naim’s authority isn’t at the expense of delicacy: the fine line between muscle and subtlety isn’t an easy one to walk, but the Naim does it well. Picking out bells under the force of the dominating brass and string orchestration is effortless, and at no point do we feel short of background detail either. In fact the resolution on offer is more than pleasing at this price. Everything in the track gels nicely, and the 5si renders dynamic shifts with a good degree of fluidity. It gets precise instrument separation down to a T and, although its musical soundstage isn’t of the Rega’s expansive proportions, flutes and trumpets have room to breathe. Make no mistake, this Naim is an extremely capable amplifier, with a striking ability to get under Norah Jones’s silky-smooth, sultry vocals, while projecting them with clarity and pinpoint, dead-centre focus. The bass is taut and controlled, and never short of punch or solidity, and up top the higher frequencies have sparkle and don’t trail off too early. If you read the ‘Best Systems’ test in our October 2014 issue, you’ll know pairing the amp with its matching (and terrific) CD player, the CD5si (£995), and a pair of B&W’s 683 S2s (£1150) gives you a cracking system. And that’s still true – even if the Rega might now be considered an even better substitute, for its greater transparency and rhythmic flair. There’s nothing off-putting as we move away from sound either – as long as you’re not expecting digital inputs. Or Naim’s usually extensive upgrade path. What analogue connections it does have are fine: four stereo RCA inputs, two DIN connectors and a sonically consistent 6.3mm headphone output that sits on the right-hand side of the tidy façade. We like the Naim’s smart-yet-simple look; it has a great build (which happily extends to the remote control, too). There’s no doubting the Nait 5si’s talents; it will shine at the core of any system made up of talented-sounding, like-minded electronics. We knew it was a class act when we first heard it. It’s been a year since then, yet this hasn’t changed our minds. The competition is tough, but this is a five star performer.